We’ve all heard the saying “There’s no such thing as a free lunch.” This same theory holds true when it comes to shopping online, so we could say, “There’s no such thing as free shipping.” For this reason we choose to offer our best prices to you the customer, and add the shipping charges based on your location. This allows us to extend our best deal to you, and avoid inflated shipping charges... giving you more value for your dollar. Delivery is not included in the EZ-fit Shed kit cost. Your EZ-fit Shed kit will arrive in a 4 ft. x 8 ft. bundle or bundles. Someone will need to be present to accept delivery. Shipping will be calculated according to shed size and your geographic location. We offer nationwide delivery of our EZ-fit shed kits and chicken coops! Both items are shipped via common carrier. 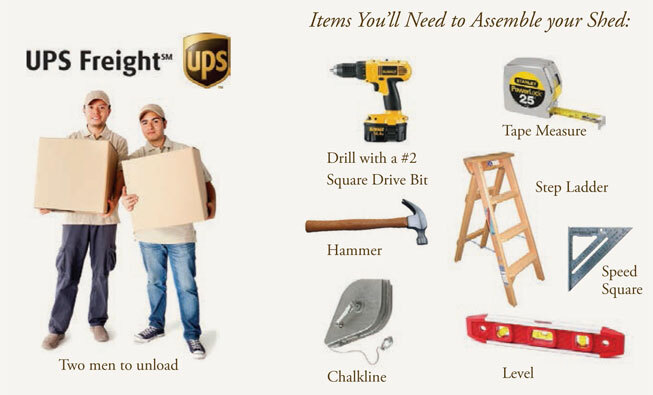 For shed kits, your shipment will come packaged on one or several pallets (depending on your building size.) The carrier will deliver your EZ-fit Shed to your house, where you must have two people there to manually open the package and unload the kit pieces from the back of the truck. Delivery to Continental United States only. Local pick-up (at our Winesburg, Ohio plant) can be arranged by calling us at 800-359-7522. Chicken coops are delivered via common carrier. Your chicken coop will arrive as a partially assembled kit and will be packaged in 1 pallet. You will need 2 people present to open the package and unload the kit parts manually. The driver may help out, but is not obligated to do so. ASSEMBLY TIME FOR THE COOPS IS MINIMAL- ONLY BASIC CARPENTRY SKILLS ARE REQUIRED. Shingles are included in the chicken coop kits. The nesting box will arrive assembled but not attached. This only takes several screws (included) to fasten it to the coop. The Optional EZ-Skid runners are shipped inside the coop. These can also be fastened to the coop in a matter of minutes. Delivery to Continental United States only. Local pick-up (at our Dundee, Ohio plant) can be arranged by calling us at 800-359-7522. All online purchases must be processed through the Shopping Cart feature for delivery. Please call for other possible payment arrangements. Orders cannot be canceled once packaged and scheduled for shipping. No Returns are accepted at this time.